Two scenes above seamlessly bring together vintage and contemporary modern furnishings. The top living room, from interior designer Jay Jeffers, features four vintage pieces blended with several unusual contemporary creations (end table, lamp, sculptures, hoop accessory) from the Coup D’Etat gallery in San Francisco. Fickett home interior, from Southern California staging company Modern Mecca, adds several contemporary items to the mix, including a sofa and chaise from Room & Board, and Kennedy chairs from Thrive Furniture. 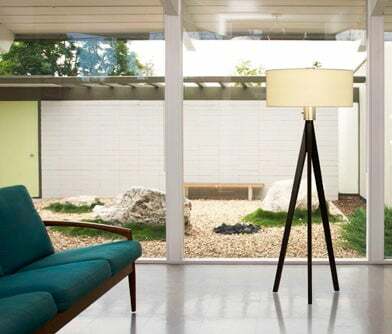 A new Nova Tri-Pod Floor Lamp adds Asian flair to this Eichler setting. Sizing up old and new: Coconut and Diamond chairs (top row – vintage), Impossible and Paper Planes armchairs from Moroso (bottom row – contemporary). The Lacey-Ronneback living and dining areas blend vintage and new. Here, a contemporary sofa, from Design Within Reach’s Bantam collection, is paired with a vintage Lane surfboard coffee table. Sacramento Eichler owners Andy Lacey and Karen Ronneback. Lacey’s Dixie night stand with a contemporary modern bed. With vintage and contemporary furnishings, Redux Stage Co. enhances this living room of an Eichler listing for East Bay Modern Real Estate. 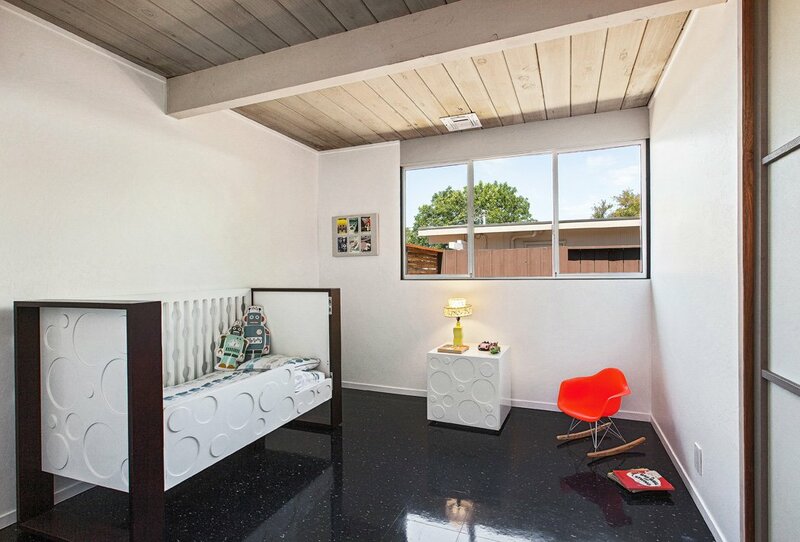 Even the Eichler baby room can get the treatment: a miniature repro of the Eames plastic rocker (from Modway) meets a contemporary bed and nightstand (Aerial Circle by Nurseryworks). 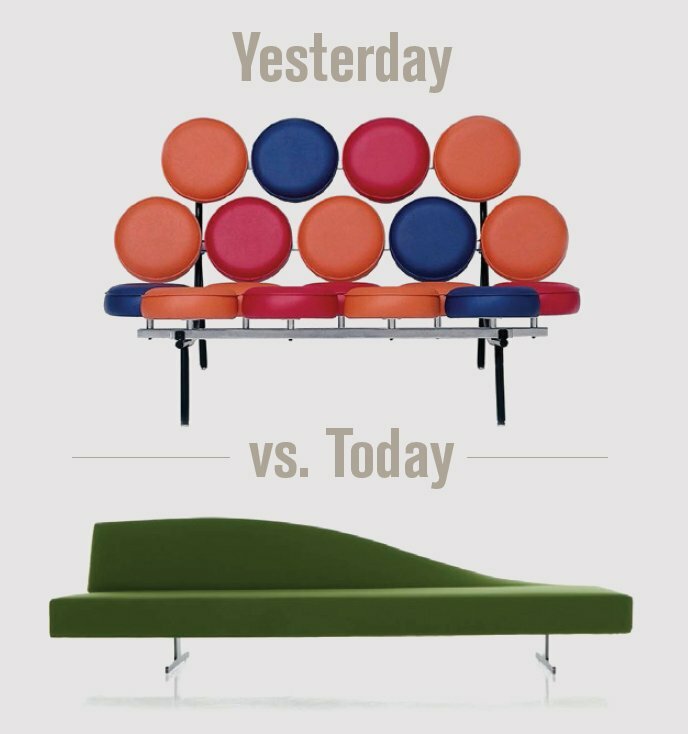 Sizing up old and new: Nelson Marshmallow Love Seat repro (top – vintage) and the Aspen sofa from Cassina (bottom – contemporary). Mid Century Mobler’s Julian Goldklang, Lucile Glessner of Lucile Glessner Design, Modern Mecca, Redux Stage Co., Vince Bravo and Severine Secret of Go2 Design. Do you want your home to look considered instead of chaotic? 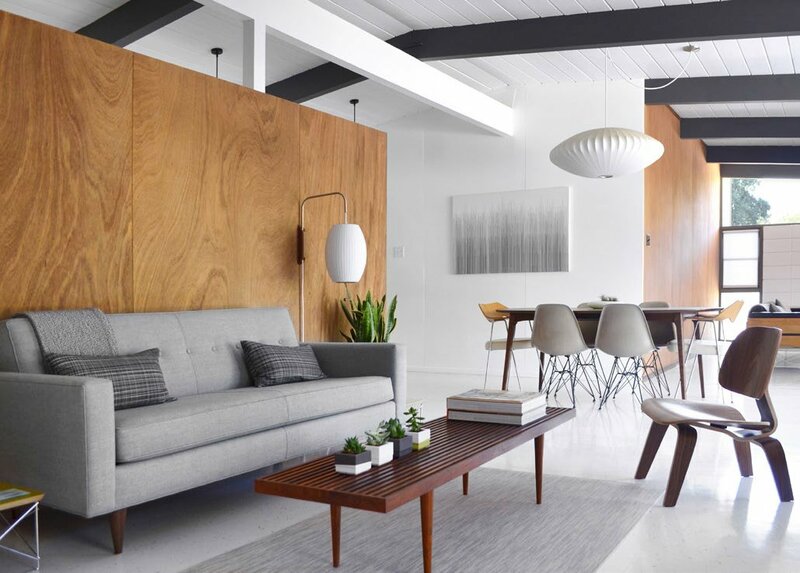 We’ve rounded up many of the best contemporary and vintage modern furniture stores in the Bay Area and online to help you get the mix just right. 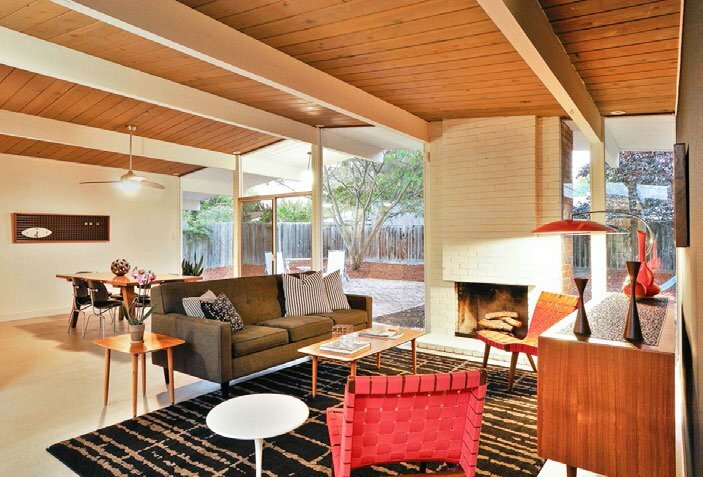 When it comes to furnishing your mid-century modern home, all bets are off. There are no rules that say all the furniture in your home needs to come from the 1950s and ’60s. In fact, embracing contrasting periods, and blending period with contemporary furnishings can give your home a level of beauty and interest that having everything from one period cannot. Some of the most inspiring residential spaces combine an old (vintage) and new (contemporary) aesthetic that give a sense of being assembled over time. Glessner says a home should represent its occupants, their needs, interests, and experiences. The furnishings should be sized for the space, sparse, and stylishly on point, as well as functional. There are no hard-and-fast rules for how much vintage, whether represented by original or reproduction pieces, or how much contemporary furniture should be used. A large piece, like a sofa, could be contemporary and mixed with a vintage coffee table and lounge chairs. The kitchen cabinetry could be contemporary from Italy and the bar stools, chairs, and lighting fixtures vintage MCM. “I would look for some interesting and beautiful vintage furniture items to complete the look,” Glessner says. What ties disparate pieces together is a unifying element, such as color. One strategy is to mix old and contemporary accessories with the same hue, perhaps varying monochromatic shades. Create contrast with complementary colors, such as a bright sofa; and offset sleek, smooth surfaces with rough textures while balancing straight lines with sweeping curves. Wood tones play a major role in getting the mix right. 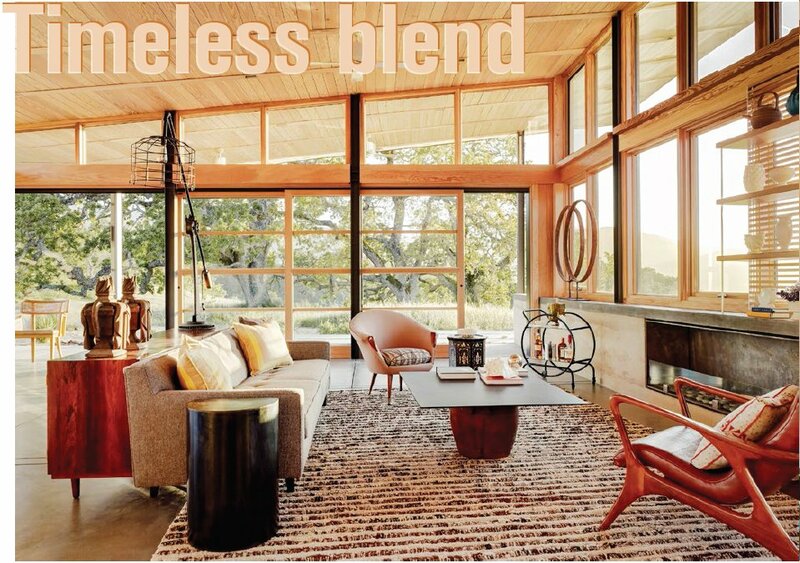 MCM furnishings have beautiful wood finishes, but many people are afraid of mixing finishes in a single room. Varying two to three wood tones can create a layered effect, and the contrast helps to create a harmonious look. If an MCM coffee table gets lost against oak-toned floors, one solution is to create a canvas for the table by placing it on top of a contemporary rug. 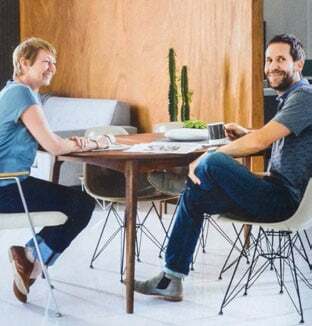 British-born Andy Lacey and Karen Ronneback live in a mid-1950s Sacramento Eichler, which they purchased in 2013, and they documented their home’s renovation on their blog fogmodern.com. 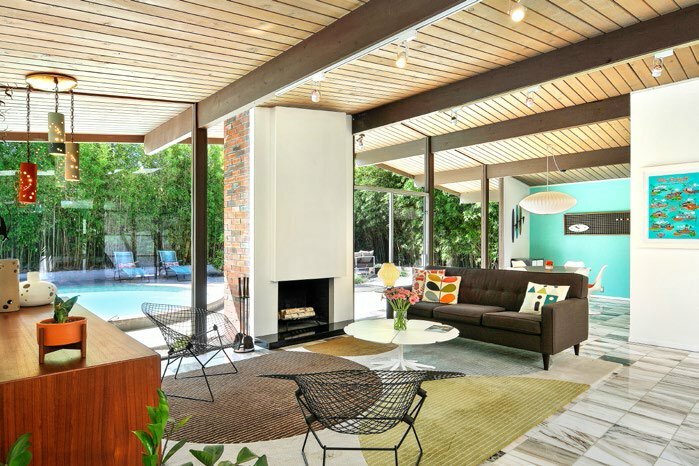 Having preserved or restored most of the home’s original Eichler features, the couple wanted these to shine through. 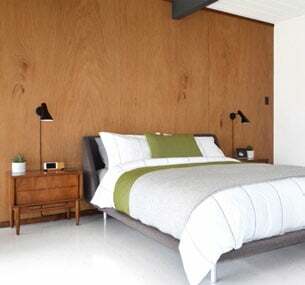 They sourced a mixture of vintage and contemporary furnishings over the last four years, but even the contemporary pieces were chosen to fit the same mid-century aesthetic, and naturally blend with the home. For example, Lacey bought a vintage Plycraft chair for just $35 and then paid approximately $200 to reupholster it. “This made way more sense to us than spending thousands on a new Eames lounge chair [reproduction],” he says. Most of the couple’s favorite pieces are both vintage and new. 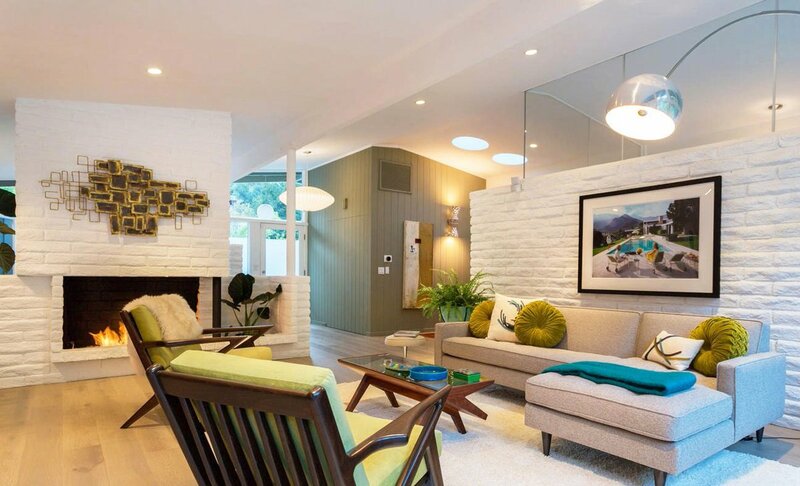 Among them are four early-’50s Eames shell chairs, a Lane surfboard coffee table, Modernica case-study planters, and a collection of George Nelson Bubble Lamps. So how does a homeowner know when the furniture mix is right? It all depends on the house, the homeowner, and the look you are after. Finding the right mix depends on a balance between functionality and style . Most people care about the comfort of a sofa or a chair; for instance, a vintage sofa might not be comfortable enough for a family to use for watching television or for entertaining. Also, since a MCM dining table might not be large enough by today’s standards, one might turn to a larger reproduction or a contemporary option. Style is very personal, but many people are educating themselves on options online via Houzz and Pinterest , and by shopping on Etsy and other online websites . Soliciting help from an interior designer can help to incorporate contemporary and vintage pieces for a finished look. They evaluate the space and use space-planning tools to furnish it according to their clients’ desires and budget. Consideration is given to personal style, color preferences, and what furnishings a homeowner already has in their collection. Proposing vintage and contemporary furniture and accessories will stem from there. “An interior designer will help you think of every aspect of your space and home in a holistic and sustainable way,” Glessner says. Where to start? There are a few avenues you can take when you’re embarking on the search for vintage pieces to incorporate into your collection. “However, I would not suggest going out on the hunt for something vintage just because you want something vintage,” says Vince Bravo, a Bay Area dealer of furnishings from the mid-century. Then when is an ideal time to introduce vintage? “Most people can identify an item or two in their home that they know is stylistically off-putting,” Bravo added. 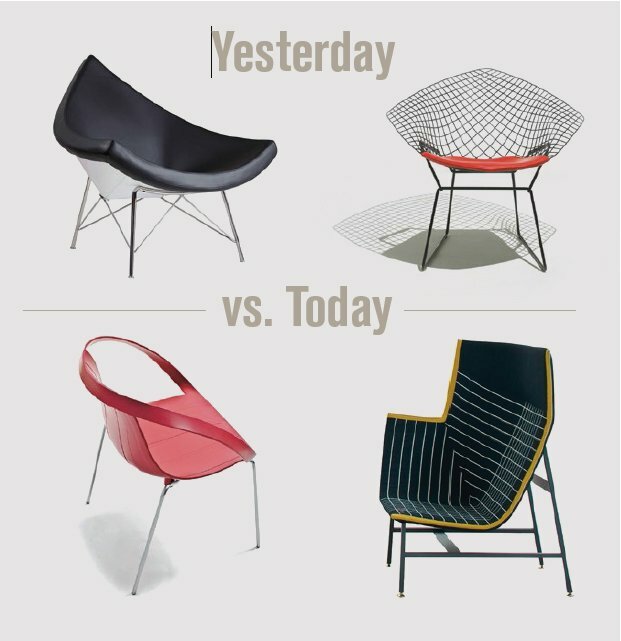 For example, if you’re always thinking that you never liked a certain clock or a chair that you purchased from a box store, Bravo recommends upgrading those pieces to something vintage. This way you’re still fulfilling a need you have in your home but upgrading the level of style. 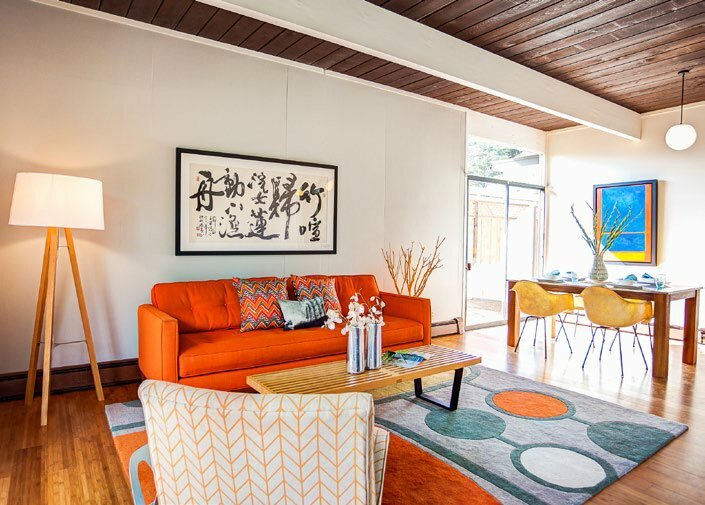 For homeowners who are collectors and want to recreate the mid-century vibe in their homes, studying interior photography from the period is a great place to start. Many design magazines have been digitized and can be found online for free; and Pinterest, Instagram, design museum archives, and countless blogs have hundreds, if not thousands, of images at the click of a button. Collectors who enjoy the 1950s Googie style tend to never have enough atomic lamps, starburst clocks, airbrushed art, kitschy salt and pepper shakers, dog nodders, hula girls, and Tiki mugs. Those collectibles lend themselves to be amassed in large qualities and displayed in layers on bookshelves. “We try to hit that middle range, for people who are looking for a well-built piece, and they don’t mind whether or not a name is attached to it,” Goldklang says. For this reason, and also because of continued demand, quality vintage continues to climb in value. As in life, there are no shortcuts to creating a perfect balance in any living space. It is time-consuming to create a home that is functional, uncluttered, and beautiful. The devil is in the details.